This photograph was taken by Mama on the same day that she took the photographs on the December 2016 blog post. 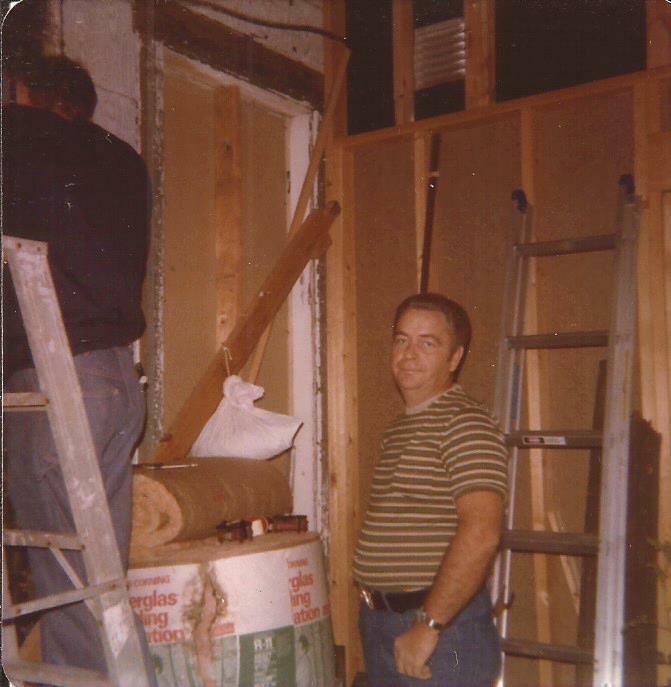 She and Daddy were visiting us for a weekend then and Daddy was helping Gain work on the unfinished back porch of the house. It was an enclosed porch, and we had planned on making it into an extra room, but sold the house before that project was finished and moved to Wheeling. Gain and I were sitting on the couch in the living room in this picture. 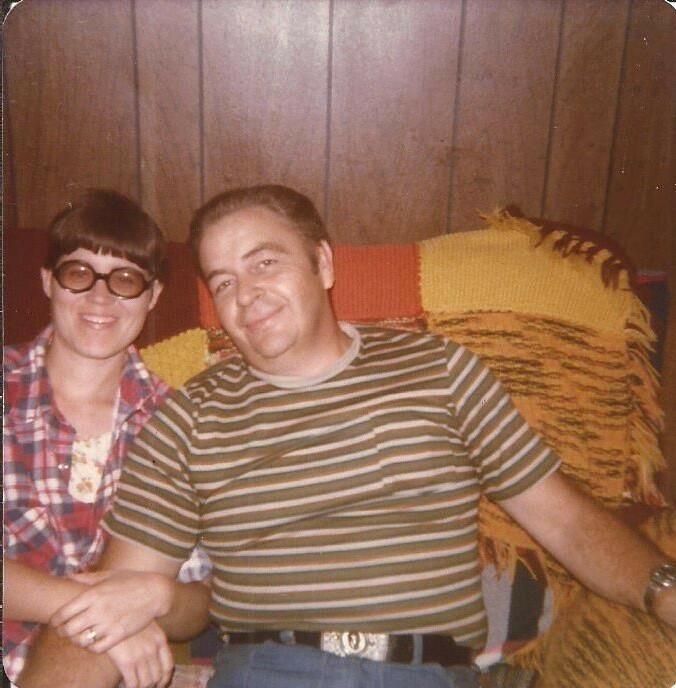 In Mariette's story, Auto City is a fictionalized Kokomo, but hers and Curt's first home, before they move to Carrollton Location, looks exactly like Gain's and my house in Kokomo. Carrollton Location is a fictionalized Wheeling, and looks exactly like our real place in Wheeling. Some of the characters in the story are based on real people and some are entirely made up. The red dog, introduced in this chapter, is real. So is Miss Dunbar, based on our neighbor, Miss Dunn, who has long since passed away, I am sure. She did indeed generously take table scraps over to the red dog, who is also I am sure long gone. In the original unfinished story Miss Dunn and the red dog were only minor characters, but they have both told me now that they want a bigger part in the story. They will both appear again in later chapters. When Mama and Daddy visited us Mama often visited with Miss Dunn, who was retired from Continental Steel in Kokomo. Mama has some beautiful roses in her flower books of some of Miss Dunn's roses, which I will post in later chapters. As the story develops, the original plan was to have a few main characters, Mariette, Curt, Meaghan Louise, Nettie and Roy, of course, as well as a few others. In the horror genre, especially, there are always a few main characters , who usually can't be destroyed and win out in the end. But there are also other characters that get destroyed one by one as the story goes along. This is especially true in B grade horror movies and cheap paperback horror novels. Gain and I laughingly referred to the minor characters as "expendable characters", as that was really their only reason for being in the story. I had originally planned to follow this plot pattern in Nightmare House. As Mariette's nightmares become more vivid and real, and are shared by other characters in the story, the plan was, as each of the minor character's worst nightmare came true, their part in the story was ended. Now, I think, though, especially after Miss Dunbar and the red dog have demanded bigger continuing parts in the story, the rest of the minor characters will refuse to leave the story too. So I will just have to wait and see what new plot twists and turns develop as I continue putting Mariette's story down on paper. I have a number of chapters already written and still to type before writing anymore. I will try to continue posting a new chapter along with photographs each month. Eventually I will order a hard copy of the first book from Bookemon for my files and post when it is published in case anybody else wants to order a hard copy of the book. The web version will be better, I think, though because I will always use lots of photographs to illustrate the web version. Also the web version of the story will never end. I have never heard of anybody writing a book like that before, but with more and more writers making their books into series, rather than just one book, that would be the next step. The soap operas have always used that formula, so now that everything can be published directly on the Internet for free, not just as hard copy books, or even e-books, it would be easy enough to use that story formula. And, of course, the story characters would love it because their story would never end and they could continue having more adventures forever! So I'll have to publish the hard copy books occasionally when I reach a place where the story would make one volume because I definitely want a hard copy. I love Computer Boy, but I don't trust him not to lose my story if he has the only copy! Anyway, it will be awhile before I get enough typed up for a book, and what I have still to type up and post is handwritten in a number of notebooks and is safe for now. I will keep you informed when there is a hard copy if you want to order one from my publisher, Bookemon, but the web copy and later, the e-copy, when I find a publisher for that will always be free to read. Authors have to charge for hard copy books, of course, but I still don't think it is right to charge for the e-copies when you have nothing but your time in them. And if you enjoyed writing the book, then that isn't work. If you didn't enjoy writing it, then you probably should have been doing something else. This photograph is one of the series of photographs Mama took during this visit. Gain and Daddy are working on the back porch in this picture. After Thanksgiving, winter set in in earnest in central Indiana. Curt and Mariette reluctantly abandoned their project of making the Carrollton Location property inhabitable. “We’ll have to wait until spring to get anymore done,” Curt told Mariette. The winter seemed to drag on after that when they could no longer go to the Carrollton Location property. Sometimes Mariette wondered if spring would ever come. Even though she knew that the winter seemed endless every year, still she wondered sometimes, especially on the long nights while Curt worked, if they might be stuck in an endless sameness of dark frozen time. She tried to keep busy with her writing, knowing that the long winter was an ideal time to get a lot done. Even that was discouraging, though. She mailed out her manuscripts and it was like dropping them into a black hole, never to be heard of again. Every day there was the hopeful trip to the mailbox and the disappointing trip back. Then suddenly one day all her manuscripts would be back again with stiff polite notes of rejection. Occasionally she sold an article or a filler to a small magazine. Curt was always very impressed by this, especially when she started having household hints printed in the Auto City Tribune almost every week. The Auto City Tribune only paid a dollar for household hints with a dollar bill mailed to her after the household hint was published. The magazines paid a bit more, but also all on publication. The checks were so few and far between that they were almost worse than none at all. Sometimes she felt all they were doing was keeping her hanging onto an impossible dream. Curt and other nonwriters, which included everyone she knew, didn’t understand this, though. All they saw was her name in print and the money, no matter how small, that she got for doing something they couldn’t do. Getting groceries and going to the laundromat were high points of Mariette’s week, but in the winter, bad weather often made even these tiny outings impossible. Curt was good about taking her to do these things when she didn’t want to drive because of the ice and snow, but it wasn’t the same. During this endless winter their finances seemed to be on a treadmill too. Curt worked and they put money in the bank. A little later Mariette had to check most of it out to pay the bills. The bank balance did build, but so slowly that Mariette knew that they would be long dead of old age before they became financially independent, let alone rich, at this rate. So, the days passed into weeks, weeks into months, and the months into seasons, and looking ahead through the coming years, Mariette could see no hope for them short of a miracle. It didn’t seem to bother Curt as much as it did her. Perhaps, she often thought, I’m more greedy than he is, or perhaps just less grateful for what we have. But that didn’t stop the burning hurt of wanting, of wanting more than what they had. Of wanting the freedom of ordering their own lives instead of having them ordered for them by General Motors. So, Mariette entered sweepstakes, believing that eventually the law of averages would have to bring their lucky number up. Curt encouraged her in this, and together they spent the interest, never the principal, of their imaginary winnings in their minds. In fact, he was the one who had first gotten Mariette interested in the sweepstakes, but now she was even more fanatical than he was about entering them. It was a week before Christmas now. Mariette had never felt less “Christmassy”. She woke up at one P.M. Curt was still asleep and she got up carefully so as not to wake him. They had their alarm clock set for four P.M. But since Mariette went to bed an hour or two before Curt got home in the mornings, and he usually stayed up another half hour to an hour watching TV and “unwinding”, she often woke up before he did. It was another gray bleak day, just like the one yesterday, and the one the day before yesterday. There was still snow on the ground, but it was dirty white now and frozen into a hard crust. Mariette put her old coat on and went out to the back yard to take the garbage out. There really wasn’t enough to bother with, but she felt she had to get out for at least a few minutes, or go crazy. The red dog was standing beside his dilapidated old dog house, yapping as usual. Sometimes Mariette felt as if she would start screaming and never stop if she had to listen to him any longer. Apparently, he didn’t bother his slovenly owners, whose house and yard, one house removed from Curt’s and Mariette’s, were as dilapidated as the dog’s house. They kept him chained to his house all the time and seldom came out to pet or talk to him. Mariette was sure that he only managed to stay alive on the table scraps that their elderly neighbor on the other side, Miss Dunbar, fed him. She was also certain, although she had no way of knowing, that the dog’s owners hadn’t provided him with so much as a dirty worn out blanket in his dog house to keep him warm. It was bitter cold. Mariette’s feet crunched on the snow. The dirty smoky smell of the city seemed imprisoned in their back yard, held there by the lowering gray sky. There was no one else around. Mariette and the yapping Irish setter might have been the only living things in Auto City. She noticed as she threw the garbage into their can how thin the dog was, even thinner than before if that was possible. An unwanted feeling of guilt that they had so much food they could throw some of it away, and a crushing pity for the animal threatened to overwhelm her. Quickly she turned and hurried back into the house, not looking at the dog again. Today was going to be a bad day. She could feel it already. Mariette was suddenly overwhelming tired again. She decided to nap on the couch for a couple more hours until time for Curt to get up. When she got back to the house, though, Curt was already up watching television. “Did I wake you up, honey?” she asked, ashamed of the feeling of disappointment she felt because now her nap was spoiled. “I’ll make us some coffee.” She started the coffee and then came back to the living room. “Did you get the mail yet?” Curt wanted to know. The mail was one of the high points of both their days, especially in the winter. “No, I was just getting ready to. I took the garbage out first.” Mariette put her coat back on and went out to their mailbox on the front porch. Mariette shook her head. “Just advertisements and catalogs. No bills at least.” And no returned manuscripts either, she added silently to herself. While they drank their coffee, they looked at the mail. Mariette took charge of the sweepstakes envelopes, all from Magazine Clearinghouse. “We’ll need a hundred banks to put all our money in,” Mariette said with satisfaction. They both always agreed that they would never put more than the amount the FDIC would insure in any one bank. If ever they were lucky enough to win the really big money they would never do anything to risk their capital. “And we’ll eat at the West Fork every day,” she added. Mariette nodded solemnly. She had great respect for Curt’s financial knowledge. She never doubted that the only reason they weren’t already rich was because Curt had nothing to start with. If only somehow, they could get a start, though, he would soon double, triple, and quadruple their money. “I’d better start supper,” she said at last. As enticing as the game was, it was after five P.M., and sitting here spending their future fortune did nothing to get today’s chores done. Mariette brought Curt the before meal peanuts and salad he enjoyed, and went back to get the rest of the meal completed. To Curt, salad meant cut up raw vegetables of various kinds, turnips, cabbage, carrots, etc., which Mariette washed before arranging on a plate so that he could salt them for his snack. He always saved part for her to eat with her meal. She was still tired, and the letdown to reality after playing the “money game” with Curt did nothing to help her mood. Mariette was a good cook. She used to enjoy cooking. Sometimes she thought if she had to plan and prepare another meal, she couldn’t stand it, though. It was the endless monotony that wore her down, she supposed. Still, they had to eat, so she began putting together a hasty meal of hamburger gravy and biscuits. It was almost worth it when she saw Curt’s face light up when he saw what they were having. Hamburger gravy over biscuits was one of his favorite meals. The sat in front of the TV set, eating their meal off the coffee table as they always did. The Fall Guy was on and they watched that. It was one of their favorite programs. Then Mariette stacked the dishes to wash later, and they napped on the couch with the sound turned down low on the television until time for Curt to leave for work. They did this nearly every night too, and as always, the evening seemed to pass too quickly. After Curt left to go to work, what little energy Mariette had deserted her. Their evening together had been the bright spot in the gray day, but now depression closed down on her again. She couldn’t face the sink full of dirty dishes. She couldn’t face working on her stupid novel that probably wouldn’t sell anyway. She couldn’t even face entering the sweepstakes. And she didn’t even have energy enough left to read or watch videos. Knowing that she was probably trashing the whole night, as far as getting anything done, but too tired to care, Mariette set her alarm clock for two A.M. and laid down on the couch with Lambie-Pie and Curt’s afghan. Weird dreams that she couldn’t afterwards recall disturbed her sleep. The alarm clock went off at two A.M., and Mariette reset it for three A.M., and then four A.M. Finally, at four A.M. she got up, still feeling groggy. She carried the Magazine Clearinghouse sweepstakes out to the kitchen table. At least she would get them ready to mail, and then maybe tomorrow she could get back to getting more done. Carefully Mariette punched out the little pictures of cars and the special gold stars that ensured their eligibility for the ten-million-dollar super prize and pasted them on the official entry forms. She checked the official rules to make sure she’d done everything right so they wouldn’t be disqualified. Then she wrote the date she would mail them, and the deadline date, and drawing date on the outside of the envelopes the sweepstakes had been sent in, and filed them in her “sweepstakes file”. She noted with satisfaction how many sweepstakes they were already entered in. Soon they would have to win with that many entries. Finally, she laid the stamped envelopes containing their entries on the coffee table for Curt to mail in the morning. She could mail them herself tonight, but she wanted him to touch them to “put luck on them” as she always had him do. At last Mariette took Lambie-Pie and went to bed, although it was still a couple hours before her usual bedtime. It had been a long day. 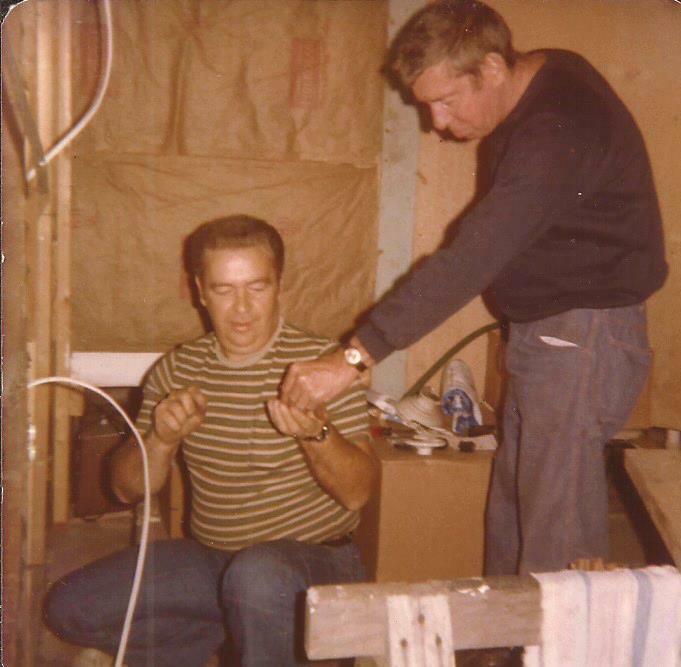 This is the last in the series of photographs of Gain and Daddy working on the back porch of the Kokomo house on October 16, 1977. Daddy is on the ladder. The ones I copied of this visit were all in a book together in Mama's Sewing Room. I haven't looked at even a fraction of what she has, and there are more photographs in boxes, as well as slides that I haven't looked at, so there could be more elsewhere. If I find anymore I will post them in future chapters. I've finished the blog post chapter all but proofreading it and started the February diary part of the blog. It is just after noon now, though, and I want to go over to the cemetery, so will finish when I get back. I planted some crocuses on Daddy's and Mama's grave as well as a few of the other graves nearby, so I want to see if they have come up or will need to be replanted this fall. I planted them several years ago, but never did get back In time to check on them. 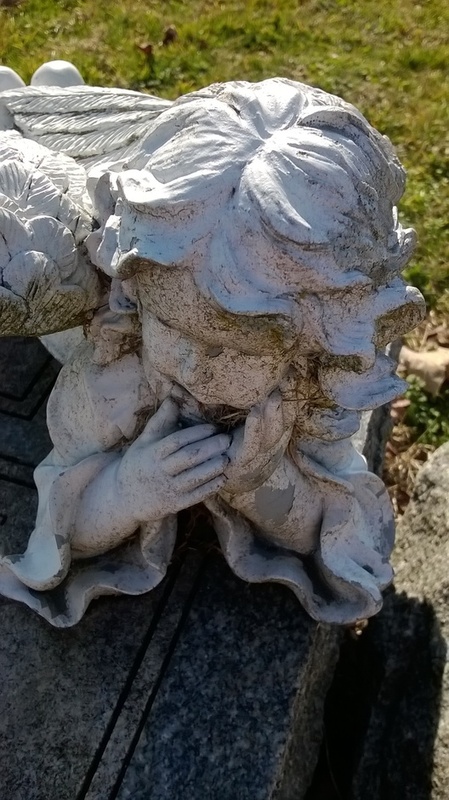 It has been an unusually warm and early spring this year, though, and the ones Mama planted in the yard have been blooming several days now, so now is the time to check on the ones at the cemetery. I had planned on leaving earlier, but it was very foggy this morning. 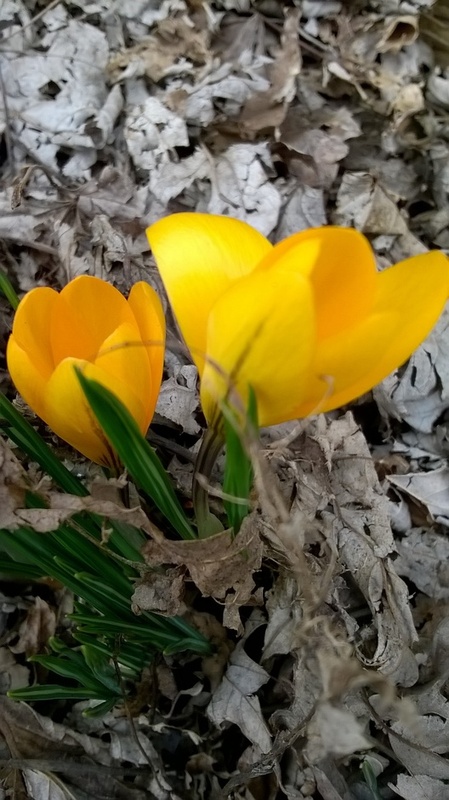 The crocuses will bloom on cloudy days, but at night they fold back up and will not reopen if it is rainy or too dark. Mama's crocuses in the yard were still closed this morning so had a little time to work on the February post. 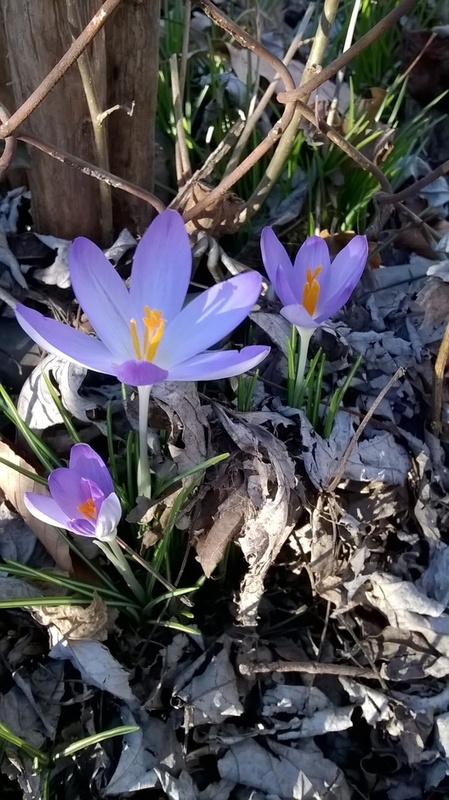 I just looked at her crocuses now, though, and they are almost opened again. By the time I pack a picnic lunch and drive to New Albany, about three miles, the ones in the cemetery, if they are still there, should be open too. 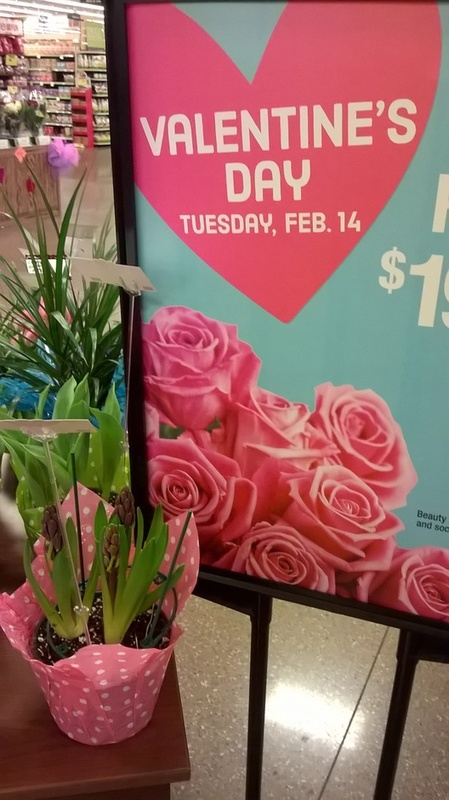 I will finish out this diary with the rest of the flower and Valentine photos (Kroger flowers and teddy bears) that I planned to post this month when I get back. Then I can also tell you about the cemetery and may have a few photos from there to post too. This evening when I finish this blog post I will also include the link to Publishers Clearinghouse, which I still need to look up. Magazine Clearinghouse, in Mariette's story is, of course, a fictionalized Publishers Clearinghouse. Back then the big prize was $10,000,000. Now the prize is even better, $5000 a week, and sometimes, $7000 a week for life, and occasionally $5000 a week forever, meaning for the lifetime of the winner plus they can leave the prize to someone else after they die. I will also include the general directions for Mariette's hamburger gravy. Yesterday when I was looking up the information and photos for this post, I looked and looked for the recipe, but could not find it. I may never have had a written recipe because at one time I had the recipe memorized. I know I did measure out the ingredients so I could make it the same way each time, and the only thing I'm not sure about is the amount of flour to use. When I get time I can recreate the recipe and will post it here. In the meantime, I will give general directions. If you can cook, you'll be able to make the recipe from that information. The recipe was invented by Gain, but he never measured the ingredients. I took this photo last Saturday. 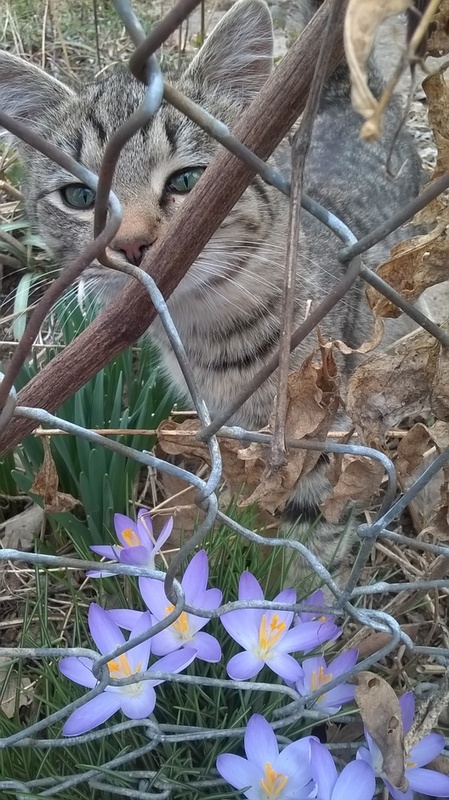 While I was walking along the fence looking at the crocuses and taking photos, one of the kittens, Baby Tiger Girl, followed me. I managed to get this one photo of her. She kept moving before I could take more photos of her. It is nearly six o'clock now so I'd better get the rest of the diary done and get this blog post proofed! I got over to the cemetery about 1 o'clock this afternoon and stayed a couple hours until just after 3 o'clock. I only saw a very few other people at the cemetery today--a couple of cars and one man evidently out for a walk. It was very quiet and peaceful there, as it usually is. It got very warm today with hazy sunshine. I am not sure if it made it up to 80 degrees or not, but it felt like it. None of the crocuses survived so I will replace them this autumn and try again. The ones in Mama's yard have spread, even growing outside the fence now, so if I can ever get a start at the cemetery there will be plenty and some of them may even spread to other graves to make flowers for them too. I take care of Daddy's and Mama's grave and a few others that I never see any flowers on, probably because their family is also long gone, but I can't take care of all of them, of course. But if the crocuses got a start maybe even more people could have flowers. The crocuses bloom early enough that they won't be in the way of the grass mowers. I cleaned all of the graves and walked around taking a few photos before I ate my picnic lunch. After I ate, I stayed about another hour and explored more of the cemetery and got more photos. I will post just a few here now, but I have more good ones that I'll share later, and there is lots more to look for so I'll probably get more photos when I go again next month. I took this photograph on January 21, 2017 the first day I saw Mama's snowdrops blooming. They are still blooming. 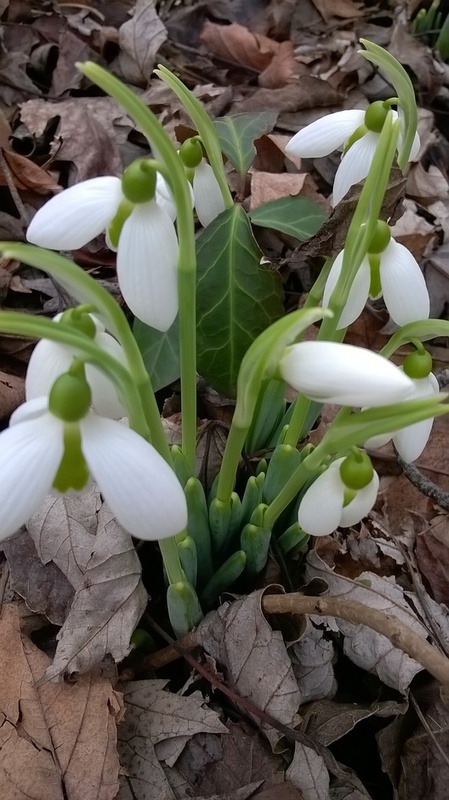 They are the first spring flowers and can even come up through the snow, which is why they are called snowdrops. They last about a month. They are supposed to bloom in late January or early February so they weren't really early this year. 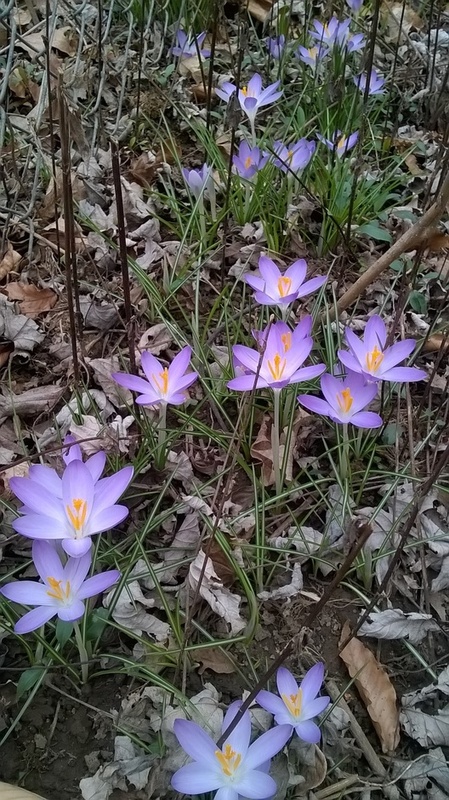 The crocuses are, though. They usually don't bloom before early or mid March. I have more crocus and snowdrop photos, but I have other photos to post now. I put some of the extras in the March folder and will post more of the crocus photos next month. These are some of Cherie's beautiful flowers that she had for Valentine's Day this year. She is in charge of the flower department at Kroger's and always lets me take photos of the flowers. 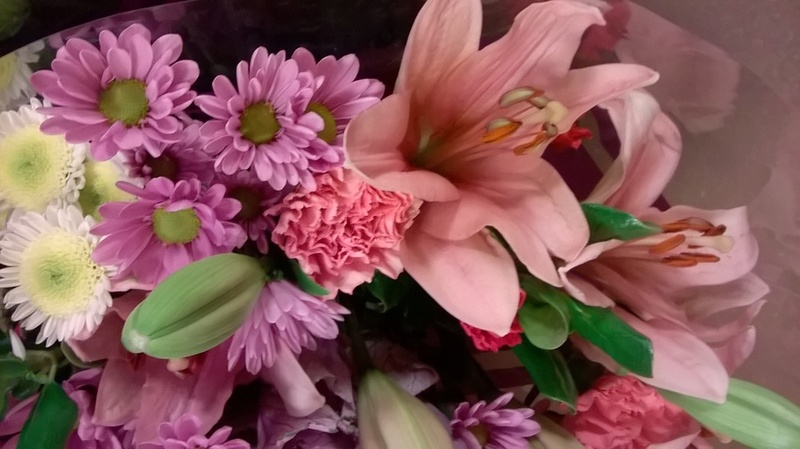 When I am in Kroger's I always stop to visit with her a few moments and look at her beautiful flowers. 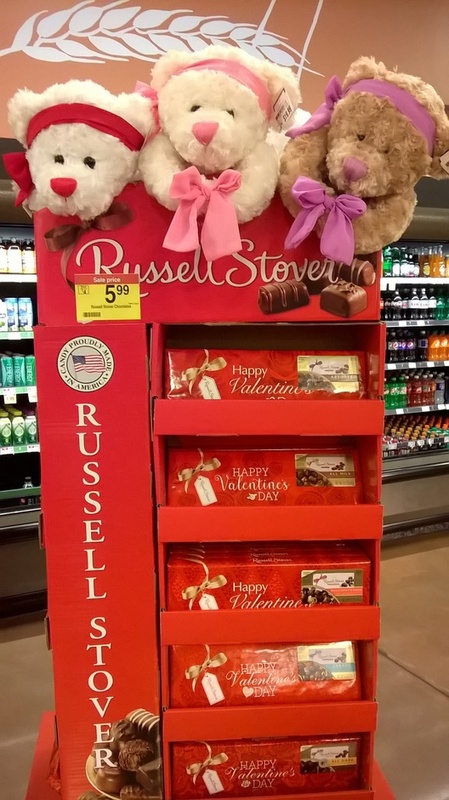 This year she had boxes and boxes of them, filling the flower department, waiting to be unpacked for Valentine's Day. Once she got them all out her department looked like a flower garden! Along with the flowers, Cherie usually has cute stuffed animals and decorations for the various holidays. 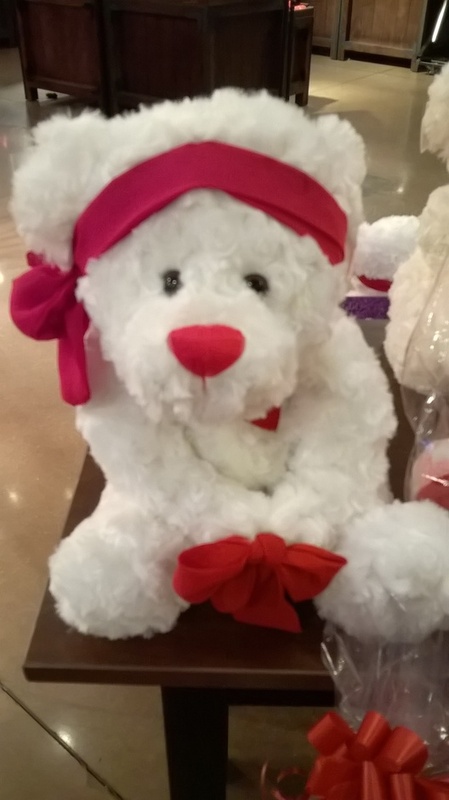 I snapped a photo of this Valentine teddy bear while I was photographing the flowers that day. This is just one of the beautiful roses that Cherie had in the flower department for Valentine's Day. Besides the cut roses she also had small potted rose bushes with flowers. 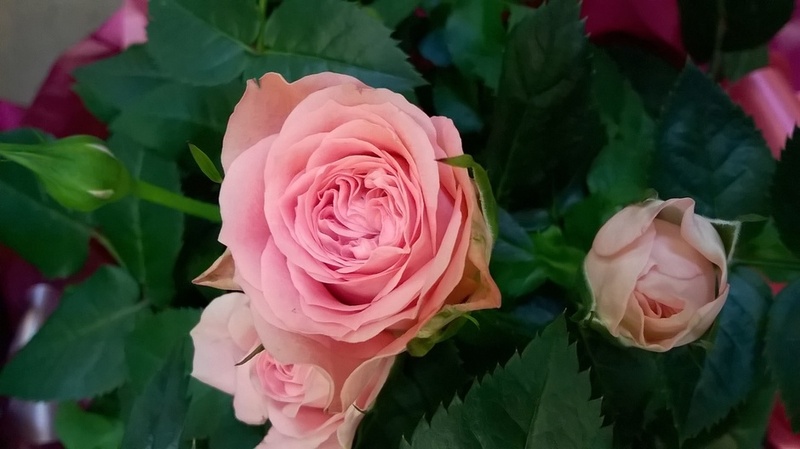 I took photos of a few of them too, and thought this photo of the pink rose was especially beautiful. Here also is the link to Publishers Clearinghouse. I think they are paying sweepstakes entries to play games, and also to do Internet searches on their website, as well as selling magazines and other merchandise. I webbed them up, and I am sure they are not charging anyone to play the games, but I will check more later and if I find out they are, I will remove the link from my website. I know I used to play some of the Publishers Clearinghouse games, and they paid in sweepstakes entries, and there was no charge to play the online games. I see there are different games now, but I will check it out later. For now, I will include the link and you can use your own judgement about this website. I would recommend ordering anything you want to from them. I have never had any problem with anything I have ordered from them, and they do have lots of nice merchandise. Brown hamburger in large skillet, stirring to break up. Add flour and brown. Add milk and water mixture and also salt and pepper. Simmer until thick. Serve over biscuits or crumbled up cornbread. This is basically how you make the hamburger gravy. I always used the cheaper hamburger with lots of fat, so didn't usually have to add much more cooking oil, but if you use leaner hamburger you might have to add additional oil. When I get time I will work out the exact measurement for the flour and oil and publish the recipe again. This makes a good meal. Usually I did not have anything but cut up raw vegetables, or in the summer ripe tomatoes with this meal. Dessert was extra biscuits or cornbread with butter and molasses, jelly, or honey. So Gain and I split the gravy for one meal with me giving him just a little over half. I could almost keep up with him on eating then, but not quite!. If you don't eat as much as we did, or have other side dishes, it could serve 4. I took a lot of photos today at the cemetery and will close this post out with a few. I will post more later. 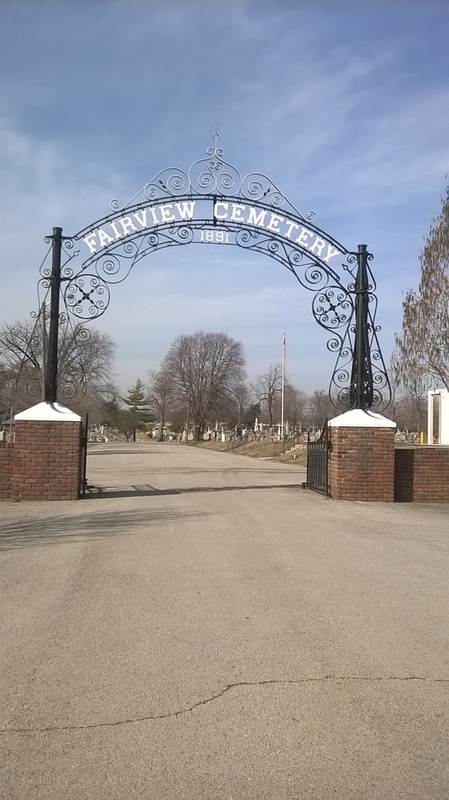 Fairview Cemetery where Daddy is buried was originally called Northern Burial Ground. I was walking along looking at some of the graves and taking photos when I saw this little dog laying near one of them. I wasn't sure which grave it belonged on, but just put it on the nearest one. When I examined the gravestone more closely I saw that the grave was a little girl's. She was only 4 years old. So I figure the dog had to be hers. 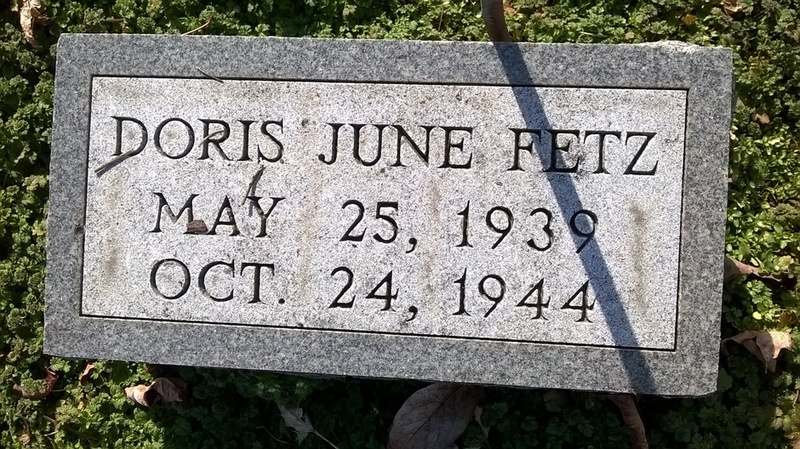 She died in 1944, but someone was still visiting her grave, evidently, even if only occasionally. 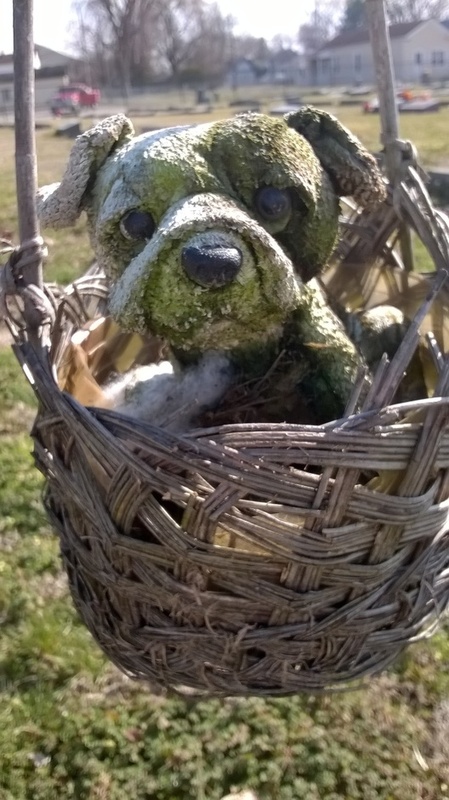 The little toy dog had obviously been there all winter, as he was much the worse for wear. I take flowers to a few of the older graves also when I take flowers to Daddy's and Mama's grave. Some of the people who probably have no one to visit anymore. 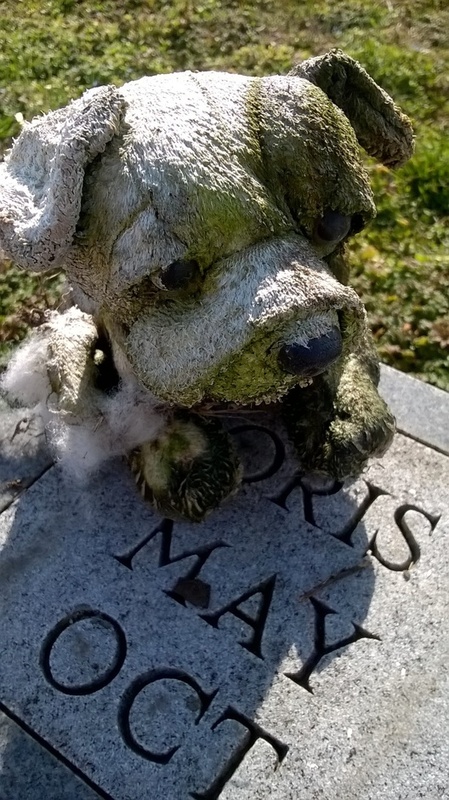 When I go back again I will occasionally take a new toy for little Doris June's grave too, although I hope the cemetery caretakers allow her original stuffed dog to remain a bit longer. 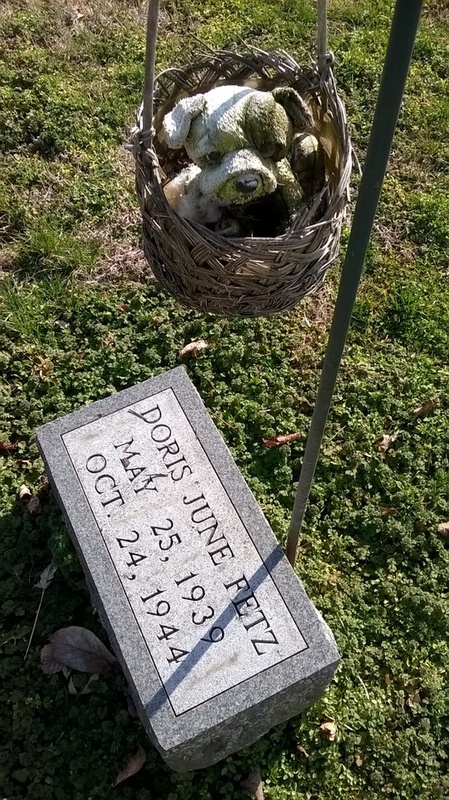 When I first saw the little toy dog laying on the ground and was unsure which grave he belonged on, I just laid him on Doris June's grave as he was closest to it. Later I realized he must belong in the basket by her grave, and was sure of this when I saw little Doris June hadn't lived until her fifth birthday. I took him back out of the basket to get this close up photo, and later put him back where he probably belonged. It is after eight thirty tonight already so I will close this blog post out and proof it tomorrow. I did check out both the Kroger's link and the Publisher's Clearinghouse link tonight and they both work. I will check out Publisher's Clearinghouse completely tomorrow and make sure the games are still free to play, but I am too tired to do that tonight. I will post this information tomorrow when I proof the blog, though. Look for the next chapter of Mariette's book next month. I will try to get it posted early in March. I will post more of the Kokomo house photographs as well as more crocus photographs with it also. This chapter will be one of the "nightmare chapters" and will be the red dog's first chapter from his viewpoint. This next chapter is really creepy and is titled "The Red Dog's Nightmare: Dream Of Annihilation". Until next month. It is after 3 o'clock this afternoon and looks as if it could pour down rain anytime, so I'd better finish this blog at last and take the cats out their supper before it does rain. There was sunshine earlier today while Hammerhead and I were at Wendy's for breakfast, but was starting to cloud up even then. He wanted to stop at Feeders Supply for more bird seed. While we were getting the seed I saw that the first daffodils were blooming near the bank and I took a few photos. Then we stopped by my house so he could see the yellow crocuses that are now in bloom. I took him home along the river road and we stopped for a few minutes at George Rogers Clark park. The river was down some. There was one boat out with people fishing. I took a few photos at the river park. After I got home I proofed and corrected this blog post and updated Mariette's main Nightmare House page. I also checked out the Publishers Clearinghouse website to make sure the games are still free to play. They are, and they are paying in tokens which can be redeemed for more chances to enter their various sweepstakes. As I mentioned, though, they have new games and some of the new ones seemed harder to play. I will go back again, but the main game I like to play is "Plants Vs. Zombies", and most of their games were card games, or slot machine games, or other what I consider slow moving and hard to understand games. If you like the kind of games they have, though, you might enjoy them. They are also paying sweepstakes entries for doing surveys, searching on the Internet, and watching videos. And you can enter the sweepstakes without doing anything but looking at the things they have for sale. You don't have to buy anything or play any of the games. I entered the latest sweepstakes for $7,000 a week for life prize, but did not see anything I wanted to order this time. So their website is definitely worth checking out, and if you don't like it, you don't have to go back! They still have a lot of nice merchandise for sale plus many magazines. I have been doing business with them for years. So check them out! 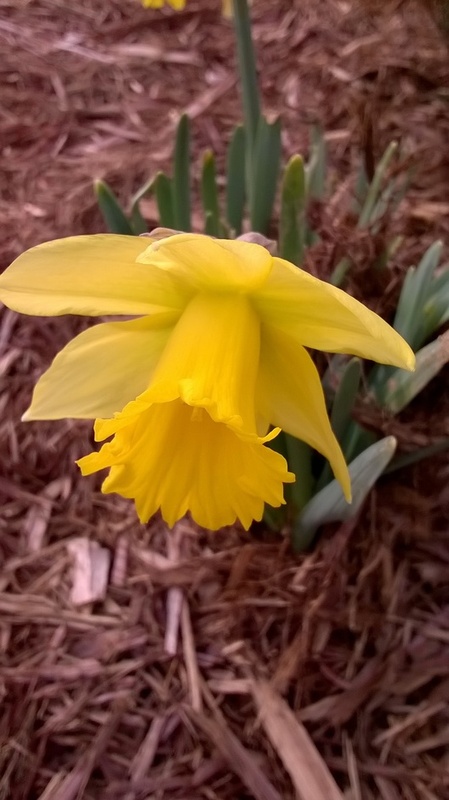 I will close this month's blog post with a photograph of one of the daffodils I took this morning. It is now going on 4 o'clock, but the February post is finally done. Hope you enjoy it. Will start gathering the material for the March post soon so that perhaps I can get it done before the last minute next time! I love to read such stories on http://www.bestdissertations.com website. That is based on real-life characters and I do a lot of enjoying and such stories fascinate me a lot. I am really enjoying this story and looking forward to the end.